This has been done on satin cloth, the combination of silk ribbons and satin is truly fabulous , so soft and luxurious ! I intend getting this stitched as a cushion cover . 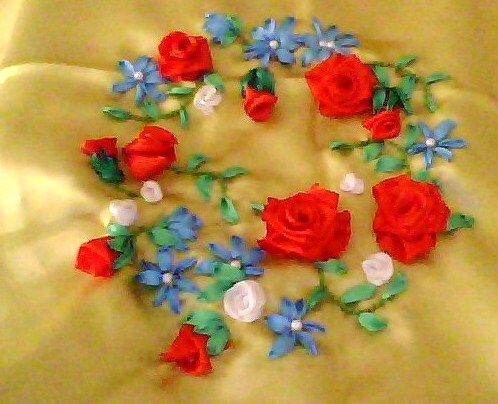 I made several red ribbon roses and stitched them on the cloth , leaves are ribbon work worked in ribbon stitch. The blue flowers are also the same stitch and I have used white beads as centres.There are also small white roses to fill up the design.